Our region is reeling under sweltering heat and there seems to be no respite for now. Mornings however are fresh and sometimes surprisingly breezy and pleasant. It is our daily regimen of spending some time in the kitchen garden to collect menthol and tulsi (basil)for tea and our daughter loves to compete with me as she runs to collect the sun ripened Baels (wood apple) that fall and lay hidden in the dry vegetation that covers the ground. Last week during one such sultry morning, a movement in the baked vegetation caught our attention. 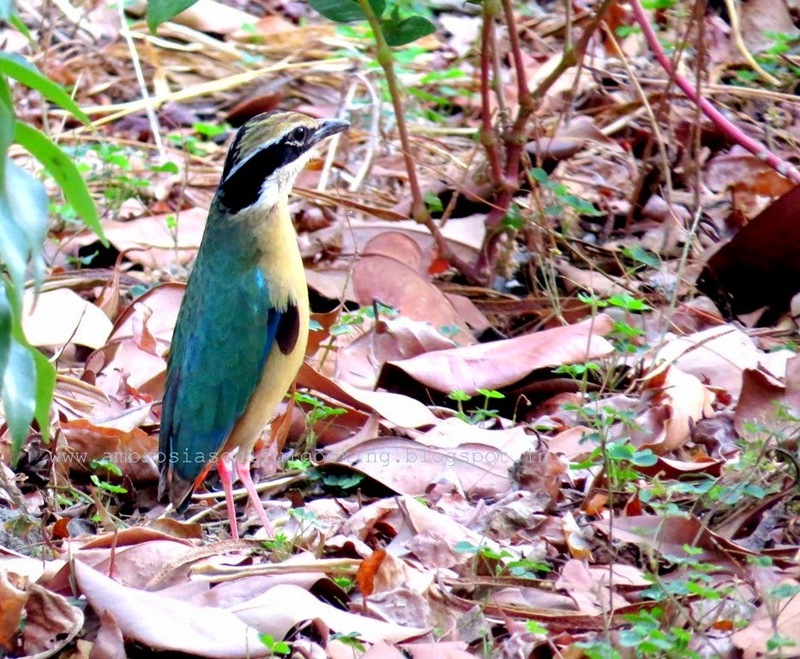 It was the Indian Pitta, a lovely migratory bird that had made appearance for the fourth year in a row. “Was it the same bird?”, I wondered as we all admired the myriad hues on its agile body. The bird hopped and hid behind the curry leaf plant merging completely with its foliage. 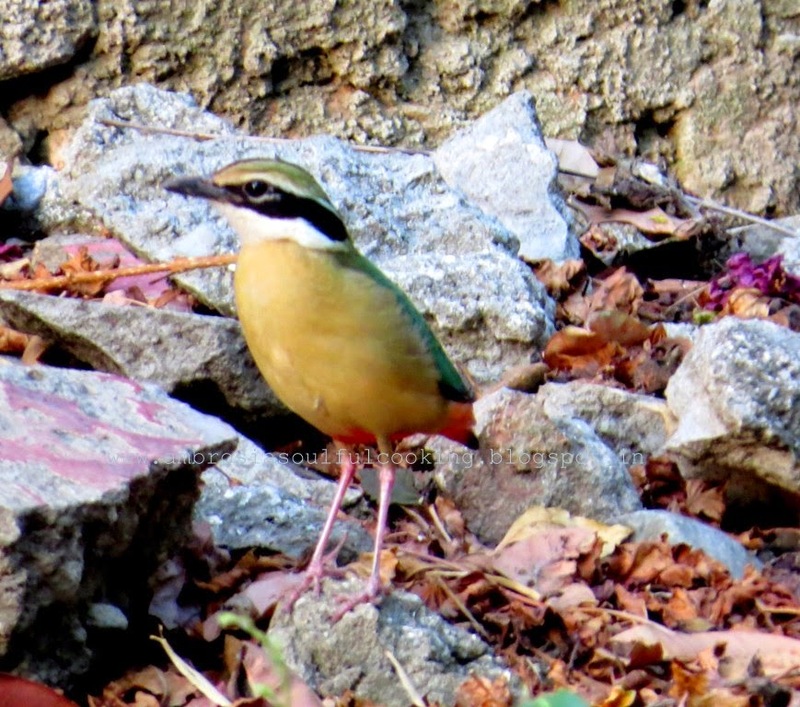 We retraced our steps intending not to disturb her and later managed to click some good pictures of the winged guest. Yesterday at the behest of my daughter I baked a cake. 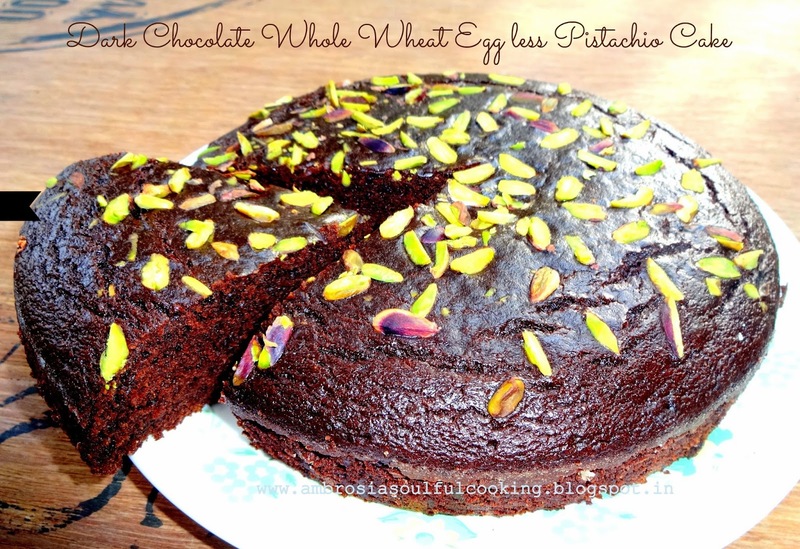 I used the basic egg less recipe and added 1/3 cup of sliced pistachios. The cake was moist and fudgy. We had it plain but it would pair well with a scoop of vanilla ice cream or cold custard. Preheat oven to 200 degrees C. Line, grease and dust one 6 ½ inches round cake pan. Beat yogurt till smooth. Add sugar and leave till sugar dissolves. Add baking powder and baking soda and mix well. The mixture will become bubbly. Let it rest for 5 minutes. Add coffee and oil. Mix well. Whisk together whole wheat flour, cocoa powder and salt. Sift the flour mix. Add flour mix to yogurt mix in three round mixing well after each addition. Stir in sliced pistachios. Reserve one tablespoon for sprinkling on top of the cake. Pour the batter into the prepared pan. 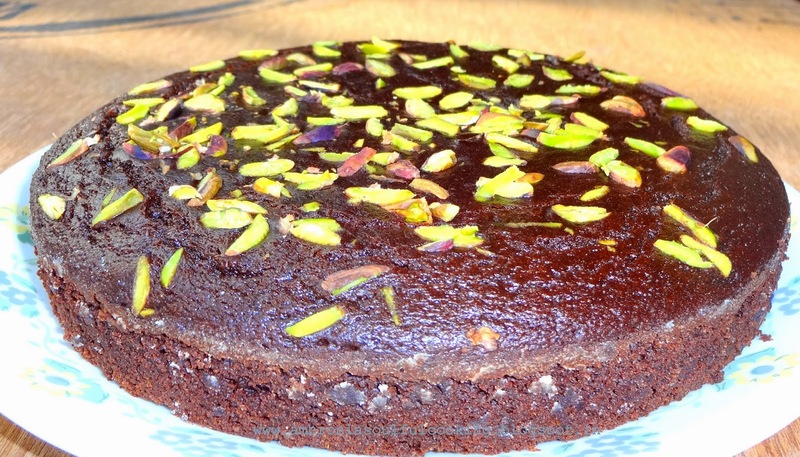 Level with a spoon, sprinkle remaining pistachios evenly on top. Bake at 200 degrees C for 10 minutes. Reduce the temperature to 175 degrees and bake for 40 – 45 minutes or till a toothpick inserted in the center comes out clean. Cool the cake in the tin for 10 minutes. 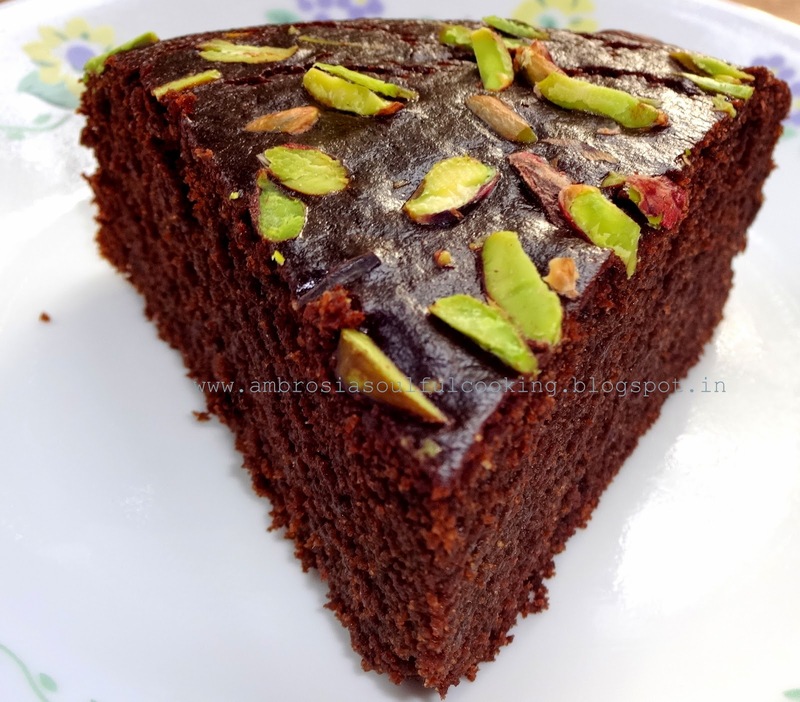 Loosen the edges by running a knife along the sides and remove the cake from the pan. Cool in the rack. Slice next day. I always wanted to bake whole wheat cake. Yesterday i saw you post and baked the cake. I just made one change to the recipe i.e added vanilla essence. But the cake didn't came out well as expected. Cake took around 1 hr to bake, still it was little bit sticky inside. The top crust also became hard. Any reasons you can think of why this might have happened? Hello! I am sorry that your cake did not come out well. This is the basic egg less recipe and is quite fool proof. I hope your curd was not too runny. Use thick curd. Was your pan big enough? 6 1/2 inches or more? when the cake bakes for a very long time, the crust becomes hard. Please let me know if this helps. Best wishes! Thanks for your response Namita. Yes. I think my curd was not too thick. also my pan was filled more than 3/4th of its size. This might be the problem then. But why did it took too long to bake? Hello! now that we understand what possibly could have gone wrong, try baking in a larger pan. The batter needs room to expand and rise. Otherwise, it remains liquidy at the center while the top and bottom begin to get over baked. All the best! Of course, you may use butter in place of oil. Melt the better and use the same quantity as oil. Butter will definitely lend a buttery aroma. Happy Baking!